If you are looking for oral immunotherapy information and experience, you’ve come to the right place. In 2011 I enrolled my peanut allergic son in an oral immunotherapy (OIT) clinical trial at Children’s Hospital in Boston. We had been dealing with food allergies since he was 18 months old, and were excited to participate in a study that could help find a cure for peanut allergy. 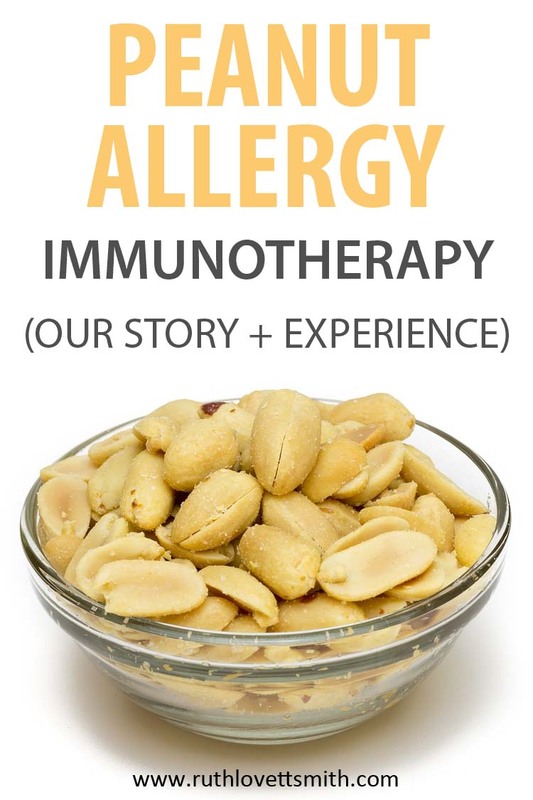 I’m sharing our story here, for others who are interested in food allergies and oral immunotherapy. Justin was diagnosed with multiple food allergies (peanut, tree nut, egg, sesame, and soy) at the age of 18 months old, after a severe contact reaction with walnuts. He had shown allergic symptoms prior, such as hives and eczema, but had never had a full-blown anaphylactic reaction. Over time he outgrew his egg, sesame, and soy allergies. However, his peanut and tree nut allergies remained. The particular clinical trial we participated in involved OIT and the use of Xolair (Omalizumab), an injectable prescription allergy/asthma medicine for patients with moderate to severe allergic asthma. The theory behind the study is that the Xolair injections would lessen any reaction from ingesting a daily peanut protein dose. Over time we decreased/stopped the Xolair injections while increasing the peanut protein dose. This method allowed us to increase Justin’s dose at a more rapid rate, compared to other studies that did not involve the use of Xolair. He completed the study in February 2012 (at nine years old) with a passed food challenge equivalent to about 20 peanuts, or 8,000 mg peanut flour. His end dose was 4,000 mg, and continues to be his maintenance dose. Following is a chart of his testing results prior to and during the study. You can clearly see his IgE numbers decreasing. There are many pros to undergoing OIT, and we are extremely thankful to have received the opportunity to participate in the clinical trial. Unfortunately there are also many cons. We’ve discovered that when Justin goes a week or more without taking his dose, he starts to have reactions. He also shows allergic symptoms with exercise, and showering, up to 4 hours after taking his dose. He doesn’t like the smell or taste of peanut, which has made daily dosing extremely difficult. Oral Immunotherapy DID work for us, and has worked for others. However, it does not appear to be a cure. For now it seems as though it simply desensitizes individuals to peanut protein. And it’s not clear whether patients will have to take peanut doses for life, or if they will eventually outgrow their allergy. It’s important to note that you should not attempt OIT at home. There are numerous studies accepting new patients, and several Allergists are now providing OIT in office. Please keep in mind that it is a time-consuming process, and a decision that should not be made without great thought. For more information on the study we participated in, click on the link below to be taken to a copy of the study results from the Journal of Allergy and Clinical Immunology Vol. 132, Issue 6, Pages 1368-1374. I must preface this update with a note that I am not a doctor or allergist. Please see your own doctor, or allergist, for oral immunotherapy or medical advice. The following update is based on our own experiences. Justin is now a 15 year old, soon to be, sophomore in High School. He has not had a peanut allergy reaction in several years. He still does not like peanut. However, he continues to take his dose. We usually dose in the evenings, after any activities. Showers no longer seem to be a problem. One thing that we have found to help is the addition of mint. Mint seems to mask the scent, and taste, of peanut. Justin takes his dose with Mint M&Ms or Mint Chocolate Chip Ice Cream. He continues to carry two EpiPens for his tree nut allergy. I hope you’ve found this oral immunotherapy post helpful. Should you have any questions, please do not hesitate to ask them in the comments section below. I will try to answer them as promptly as possible. Will you do OIT with tree nuts as well? My son is currently enrolled in a program at Mt Sinai program in NYC and once he completes the OIT with peanuts we plan to begin OIT with walnuts. My son is highly allergic to peanuts, walnuts and pecans. He is six and when he was 18 months old we were told to avoid all tree nuts and when he was 23 months he went into shock from cross contamination. Our allergist encouraged us to do food challenges with the nuts that didn’t have dangerously high levels. Consequently, he can now eat almonds, hazelnuts, pistachios, cashews, pine nuts and brazil nuts which are not cross contaminated with tree nuts aka walnuts and pecans. Jennifer – thanks so much for sharing your story and experience! My son is now 15. We will probably not do OIT for tree nuts. Simply because it’s not very likely he will eat them, and will need to for maintenance. He still hates the taste of peanut, after all these years. His allergist also recommended he do a food challenge for the tree nuts he is less allergic to. We have yet to do that, because he would need to eat those nuts regularly. I’m glad you were able to and that it worked out. While peanut OIT has made things so much easier for us food wise, tree nuts are still a concern regarding desserts and when eating out and traveling. Therefore eliminating some of those nuts would certainly make life easier. Keep in touch and let me know how things go as your son grows up! Yolande – thanks for commenting. I hope you have great results and a wonderful visit. Please feel free to reach out with any questions, OIT related or travel related. Best of luck! Thanks so much Caroline! We have another upcoming appointment. Hopefully the numbers will continue to go down. Hope you are well!! !